The Chinese entertainment industry's relentless production of films about Japan's World War II-era invasion of China  has come under the spotlight after TV extra Shi Zhongpeng made headlines in China last week for reportedly having acted as a Japanese soldier  [zh] more than 200 times last year and even having “died” eight times in a single day for different projects. With China and Japan currently sparring over islands in the East China Sea, the Japanese invasion of Manchuria in 1931 has become a safe and popular choice for movie directors who continuously face strict censorship. For example, in Hengdian film studio in China's eastern Zhejiang province, about 48 movies dealing with the Japan's invasion of China were shot in 2012. For these reasons, Chinese TV channels have been inundated with anti-Japanese movies aimed to educate, euphemistically speaking, the Chinese audience. Chinese media and netizens have questioned the intention of authorities and expressed concern over movie censorship. 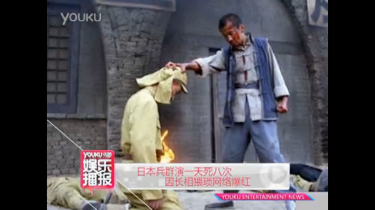 A screenshot of a report on video hosting website Youku about TV extra Shi Zhongpeng who acted as a Japanese soldier over 200 times last year. Although the Japanese invasion of China is worthy of our memory, is it really necessary to shoot and air so many movies, and try to find so many different ways to demonize Japan? It would only elevate our hatred of Japanese fascists to the hatred of the whole nation. In other countires, war movies are a reflection of the brutality and dehumanization of war, which forces audiences to reflect. Our movies reflect the justice of killing and the greatness of the leaders, which make the audience confused about the real history. But what can we do? They dress up this little girl we like to call history any way they want to, whoever dares to speak the truth will be pulled out and shot! The untruthful portrayal of the Japanese invasion makes me feel as if it's just a game, which can be misleading. This is a betrayal of history. Understanding the true history allows us to face the future with a clear head! Japan's movies about the war between Japan and the United States, Germany's movies about the German-Soviet war and American movies about World War II have inspired people's deep reflection on war and humanity. This is the source of a nation's self-confidence! The overflow of movies about the Japanese invasion is the result of censorship. Investing in movies is not a joke. If the topic doesn't pass the censors, millions and even billions of investment will be in vain. No one can afford to go through this. Therefore, people have no choice but to follow suit. Political safety is a priority when choosing a topic. Since the government gives the OK to anti-Japanese themes, then why not shoot them. In China, film innovation is the most scary and crazy thing a person can do. One can't be blamed for following the trend. The problem is that excessive administrative controls will suppress innovation and industrial upgrading, thus you have low level productions and copycats making anti-Japanese dramas. The direct consequence is a decline in the attraction of television; people will stay away from the sofa. In recent years, in big and medium-sized cities, TV watching rates have decreased significantly. Young people on to the Internet to watch American and Korean TV dramas. However, some regulators still do not understand that they have pushed their market into a dead end. What is the benefit for themselves?